To commemorate Oriflame’s 50th anniversary, we have created a special edition of our timeless classic Giordani Gold Bronzing Pearls. Made in Italy the pearls are skillfully spun, then hand-shaped by only the most experienced master craftsmen, and finally baked to sculpt the understated spherical shape. The original shade contains pink pearls to enliven the skin, coral to brighten and a trio of warm sand to give your skin a warm glow. 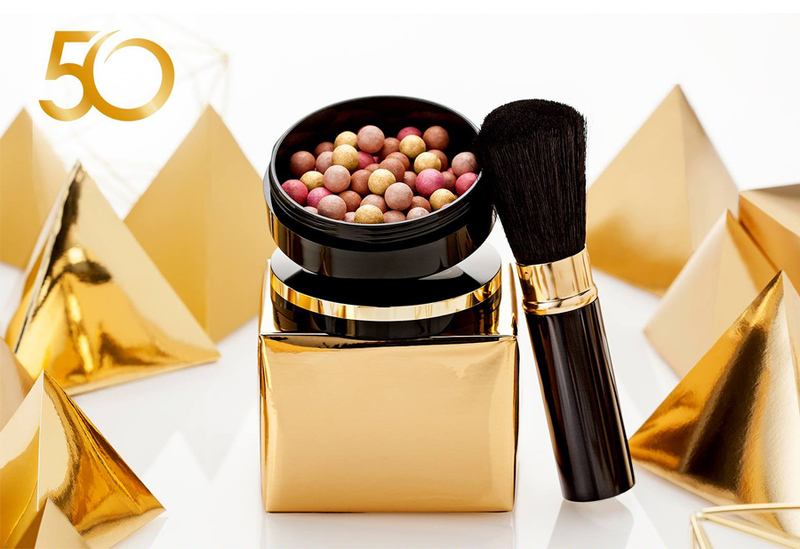 Our 50th anniversary edition launches the new golden pearl that contains real gold dust for a shimmering effect and a sun-kissed radiant finish. As enticing today as they were from the beginning, the warmth and radiance of Giordani Gold Bronzing Pearls brings a classic elegance to your beauty ritual. Octyldodecyl Stearoyl Stearate leaves a smooth creamy finish upon initial application and gives a richly comforting, lasting after-feel. Binds together and evenly disperses pigments and shimmer particles for exceptional colour clarity. Isostearyl Neopentanoate allows the pearls to glide on easily and smoothly as you brush, whilst providing a comforting softness to your skin. 1.Swirl a large brush across the bronzing pearls. 2.Apply to your face after your foundation. 3.Sweep across your cheekbones, forehead and jawline for a warm sun-kissed effect. Special Edition of the Bronzing Pearls Giordani Gold. Produced in Italy, the pearls are expertly shaped by the most experienced craftsmen. Now also with gold pearls that contain true gold dust, for a warm glow and a tan finish. 25 g.